Jay Famiglietti from NASA’s Jet Propulsion Laboratory in Pasadena, Calif., used data from a NASA satellite to analyze the drought in California. Napa, Calif.—With heavy storms just past, California expects more rain this week. It won’t end the drought, but it will certainly help: “Before the rainy pattern takes a break, cumulative rainfall will have taken a huge slice out of the long-term drought,” said AccuWeather.com meteorologist Alex Sosnowski. The biggest rains came Dec. 11, when an average of 2.5 inches of rain fell across the state and far more fell on some areas: Northern Sonoma County received almost 5 inches in a day, sending a massive surge down the Russian River. At present, the major state reservoirs stand at 54% of total average storage, 8 million acre-feet of water compared to the average of 15 million acre-feet. Most large reservoirs are still below the level of a year ago, though some smaller reservoirs are at average, or even higher. Lake Shasta, the largest with 4.5 million acre-feet of capacity, is at 52% of average storage, but that’s only 31% of its total capacity. 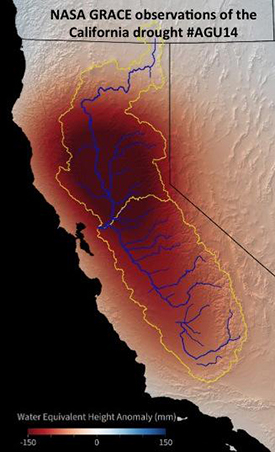 California needs 11 trillion gallons of water to recover from its three-year drought, the National Aeronautics and Space Administration (NASA) estimates after studying water resources using satellite data. “It takes years to get into a drought of this severity, and it will likely take many more big storms, and years, to crawl out of it,” said Jay Famiglietti of NASA’s Jet Propulsion Laboratory in Pasadena, Calif. Meanwhile, other NASA satellite data showed that so far this year, the snowpack in California’s Sierra Nevada range is only half previous estimates. The recent rains arrived courtesy of the Pineapple Express, a “river” in the atmosphere stretching from Hawaii to California, that’s a virtual tributary of the moist band of air circling the tropics. This wet air is typically responsible for about 30% to 50% of the annual rain in the dry western states, but this storm was particularly notable as it came during a three-year drought. At present, and with more rain forecast, the San Francisco Bay Area has received about 150% of its average precipitation for the weather year October through September. Snowpack is below average but better than last year (41% statewide compared to 29% last year). For the state’s critical mountain regions, precipitation in the Northern Sierra stands at 18.7 inches for the season to date, 139% of average compared to 3.3 inches last year, 25% of average. For the Southern Sierra, the figures are 7.2 inches, 73% of average compared to 3 inches last year, 31% of average. Snow accumulation is especially important since it fills reservoirs in the spring and summer, when water is most needed for irrigation. Fortunately, the drought hasn’t affected California grapegrowers as heavily as other farmers. Silicon Valley Bank’s recent Financial Conditions Survey of its customers and some others in the industry reports that only 36% of California wineries reported a measurable affect from the 2014 California drought. The most significant issues were felt in the California’s Central Valley, Central Coast and Sierra Foothills regions. Carlson of state water resources said that his organization will have a much better view of the prospects for continuing drought at the end of February and when the snowpack starts melting around April 1.